If you haven’t already read about the lumber lore regarding the beginnings of fraction-based lumber thickness descriptions, you’ll want to first do that. Now regardless of how plausible you think that story is, at least you’re starting to understand what a fractional designation means for lumber. But there’s more. 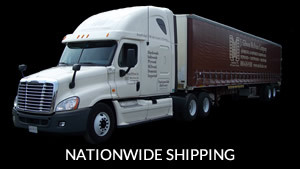 When you buy lumber described as 4/4, 8/4, or other unreduced fractions, you can be sure that the lumber will be priced according to board foot — which is a volume measurement. 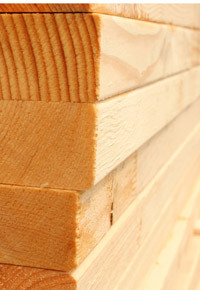 Rough lumber is necessarily sold by the board foot, for several reasons. 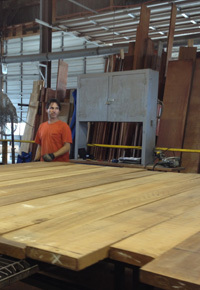 One is that the size boards that come out of any given log may be set by the log carriage, but the cutting blade is fast and will produce boards that vary in thickness across the length of each board. Based on the log shape, the width of the boards will change in unpredictable ways. 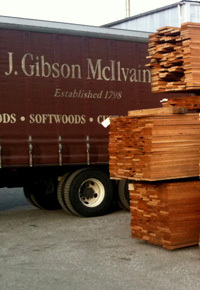 Your rough-sawn boards need to be seasoned and dried, which will contribute to further shrinking. 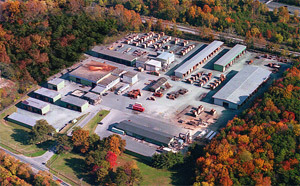 Depending on whether the board is kiln dried or air dried (or both), the amount of shrinkage can vary greatly. The goal, all along, is that once it’s done shrinking, the board described as 4/4 will arrive at the size described. So a freshly sawn 4/4 board might actually be more like 1-1/4 inches thick. But there’s always some variation when you’re dealing with an organic product, like wood. By ordering lumber by volume, though, you can at least count on a certain amount of lumber, total, even if there’s some inconsistency from board to board. Five hundred board feet of Oak will always be 500 board feet of Oak, just like a gallon of milk will always be a gallon, even if it’s poured into several cups or jars that vary in size and shape. If lumber isn’t sold by the board foot, it’s sold with linear foot pricing. Just like lumber described by fractions and sold by the board foot lets you know it’s rough-sawn lumber, lumber priced by the linear foot lets you know it’s been planed on at least two of its faces (S2S). Sometimes, it’s planed on all four faces (S4S). The pricing for planed lumber begins with the board foot cost but then adds in the labor needed to mill the boards to a set size. For the benefit of knowing the precise width and thickness of each board, you pay a little more. But the work has already been done for you, so it’s ready to be installed on your job site. Regardless of how much unreduced fractions bother you (we sincerely hope you’re not having nightmares of Mrs. McGuffy spilling red ink all over your lumber order! ), hopefully you understand a little more of why prices are what they are and what various distinctions mean, even if their origins are still a bit of a mystery.